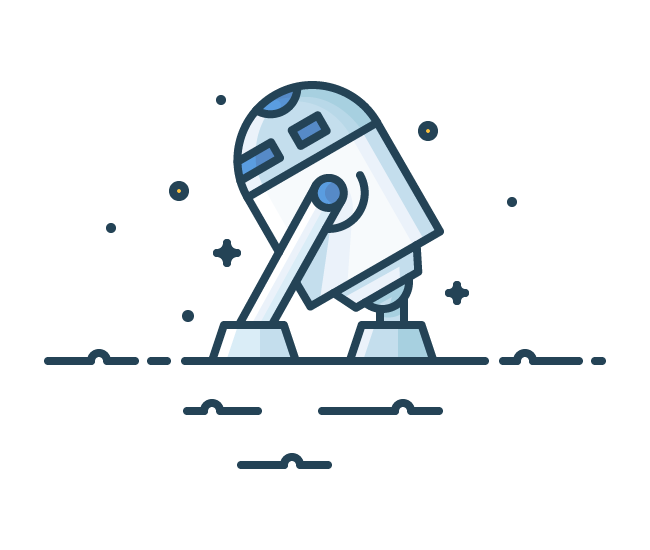 What happens when two geeks meet on Star Wars day? 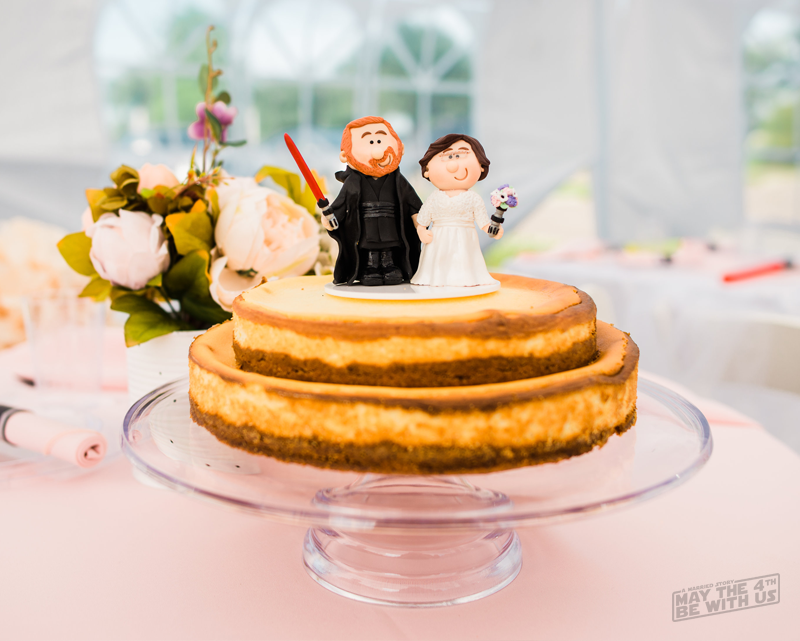 – 4 years later they have a Star Wars inspired wedding, of course! To be fair, my husband Jeremy and I aren’t even die-hard Star Wars fans and I’d go as far as to say that there are fandoms I geek out over much more often. 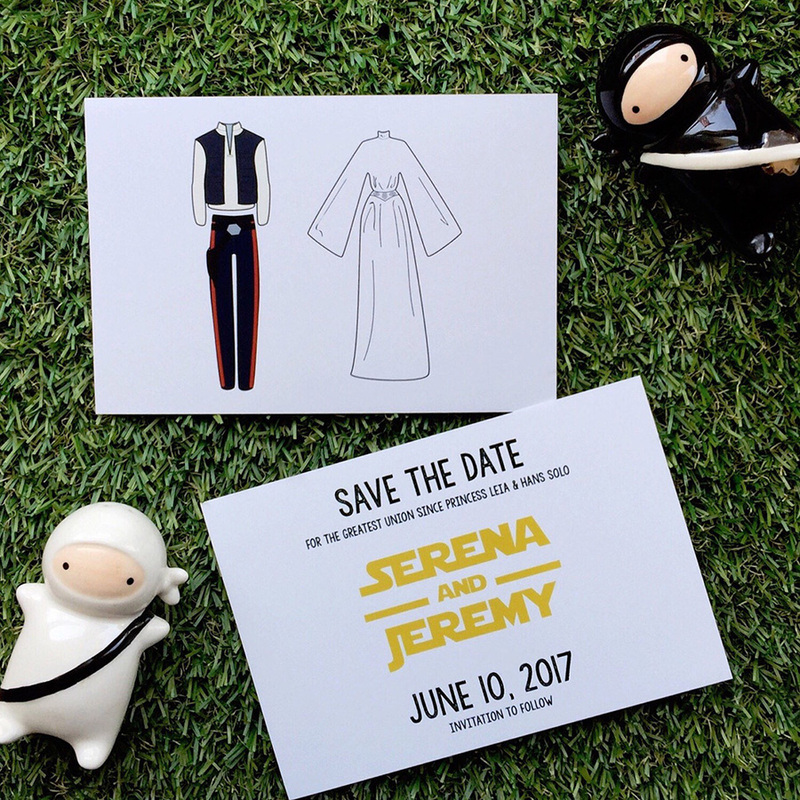 But what started out as a joke… “Haha, We should have a Star Wars wedding” quickly spiraled out of control until next I knew, I was designing custom Star Wars inspired invitations and making grand plans for incorporating Star Wars into our wedding in subtle ways. 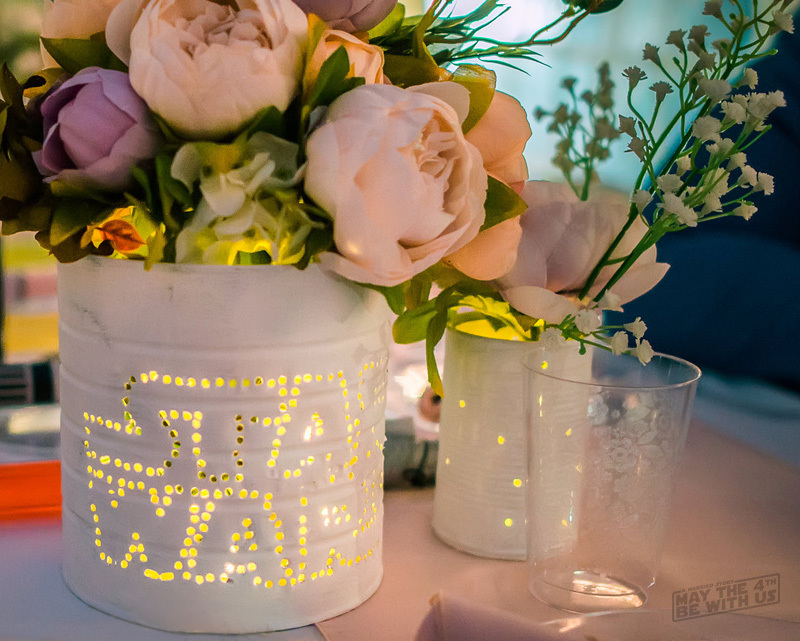 Are you hoping to plan your own Star Wars wedding? I’m the last person to judge you, that’s for sure. 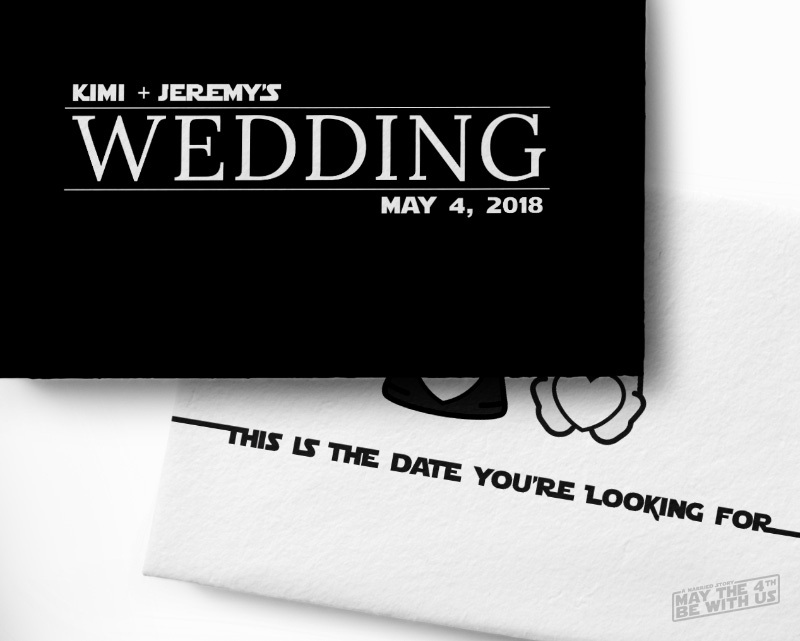 I’ve put together some of my favorite details from our Star Wars wedding as well as links so you too can purchase the necessary items to plan for an out of this galaxy Star Wars wedding. Save Money! Use eBates during checkout to earn cash back on these items. After doing some research, I quickly realized just how incredibly expensive a wedding could be. We really only wanted to spend $5,000 or less, including our venues (which is almost impossible when you live in Charleston, South Carolina) and I just couldn’t justify spending a ton of money on a card with a date on it knowing darn well that it was just going to end up on someone’s fridge – assuming it didn’t go straight into the trash. I’m a professional graphic designer, so I decided it made better sense to put those skills to work and then get the design printed at Staples. Granted, these aren’t sophisticated. They aren’t Pinterest-worthy by any means – I wanted to be able to put more money into our official wedding invitations, so I opted to not go overboard here. Still, I think they are fun for what they are. 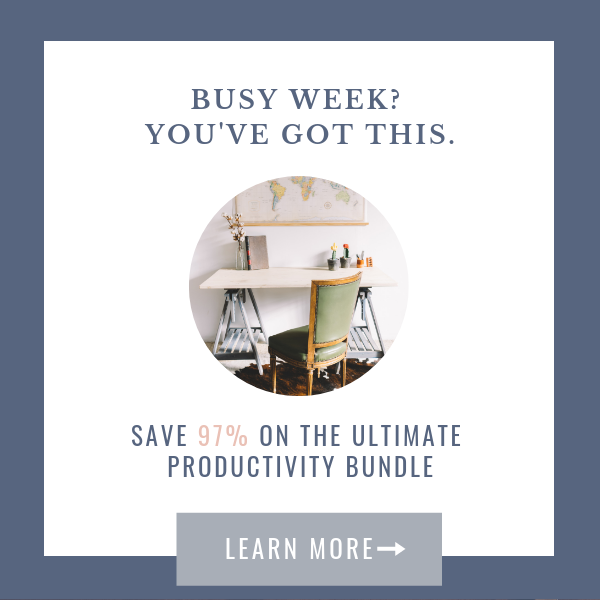 If you aren’t a professional designer, that’s okay! 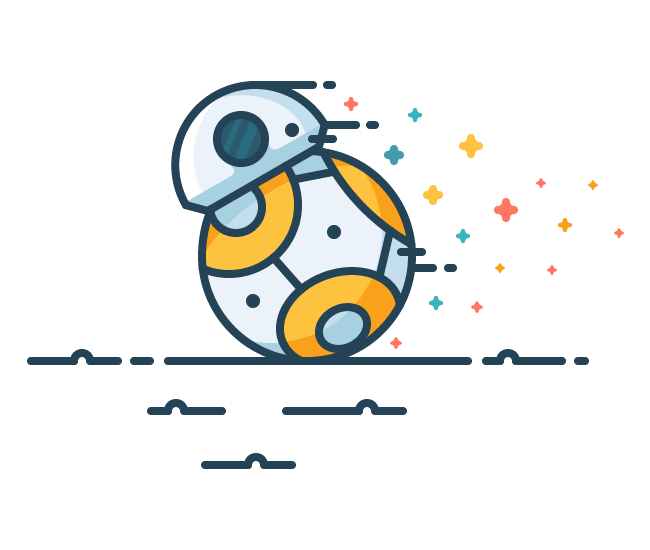 There’s no shortage of Star Wars inspired printables on Etsy. All you have to do is purchase the digital files, edit them, and have them printed at your favorite printing place (or at home… if your printer isn’t perpetually angry like mine). Here’s some I found! 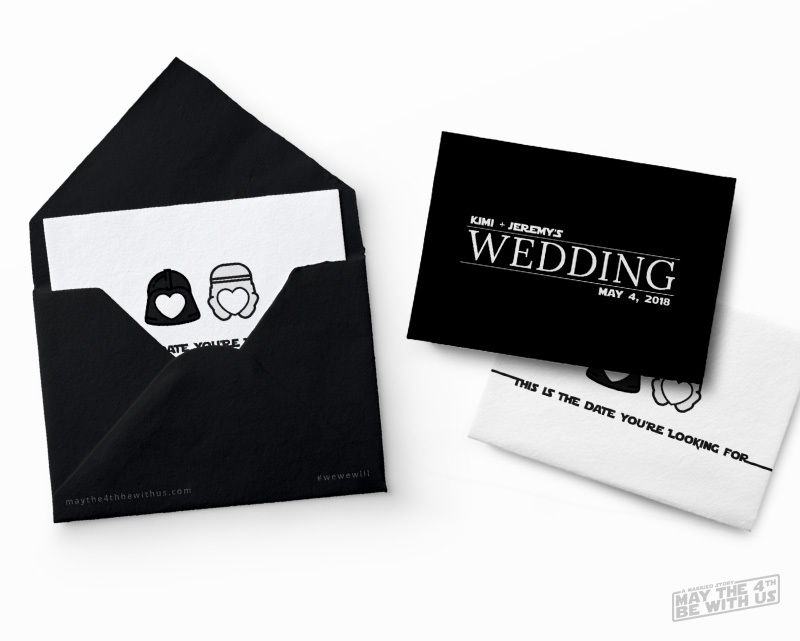 Let’s get real… I wasn’t about to find professional quality wedding invitation suites that were Star Wars themed. 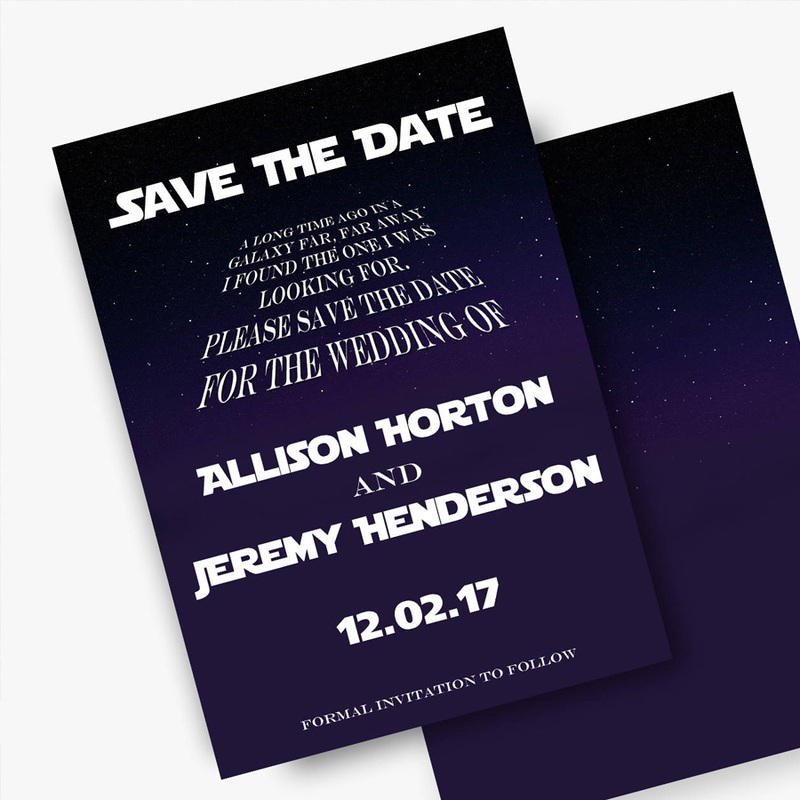 Sure, there’s certainly Star Wars inspired wedding invitations on Etsy, but again, being a graphic artist… I wanted more control. My research for custom printed wedding invitation suites lead me to a popular online shop among other wedding vendors called Cards & Pockets. 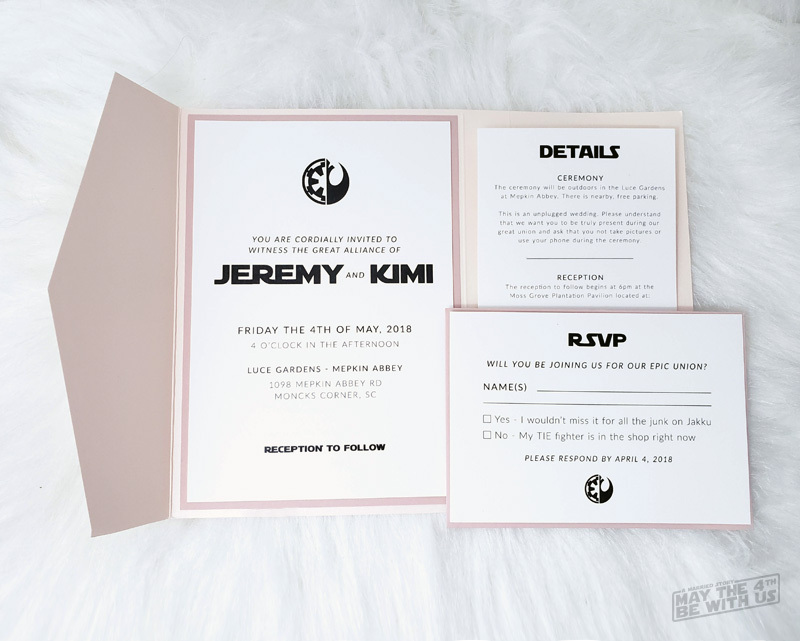 I decided to design the entire suite – the official invitation, a wedding details card, and an RSVP. I liked the idea that I could put my personal touch on the set, choose my own colors for all of the paper, matting, and envelopes – and then let Cards & Pockets do the hard work. Related Reading: Find out the most affordable place for printing cards + our experience with several companies. 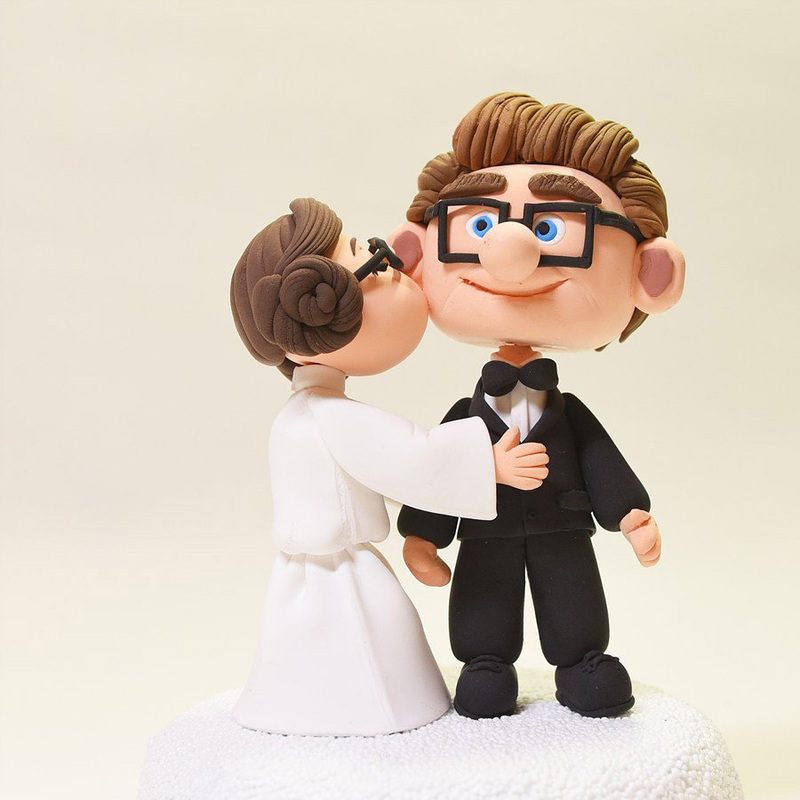 Okay, maybe this wasn’t necessary… but it’s one of my favorite little touches from our wedding details. 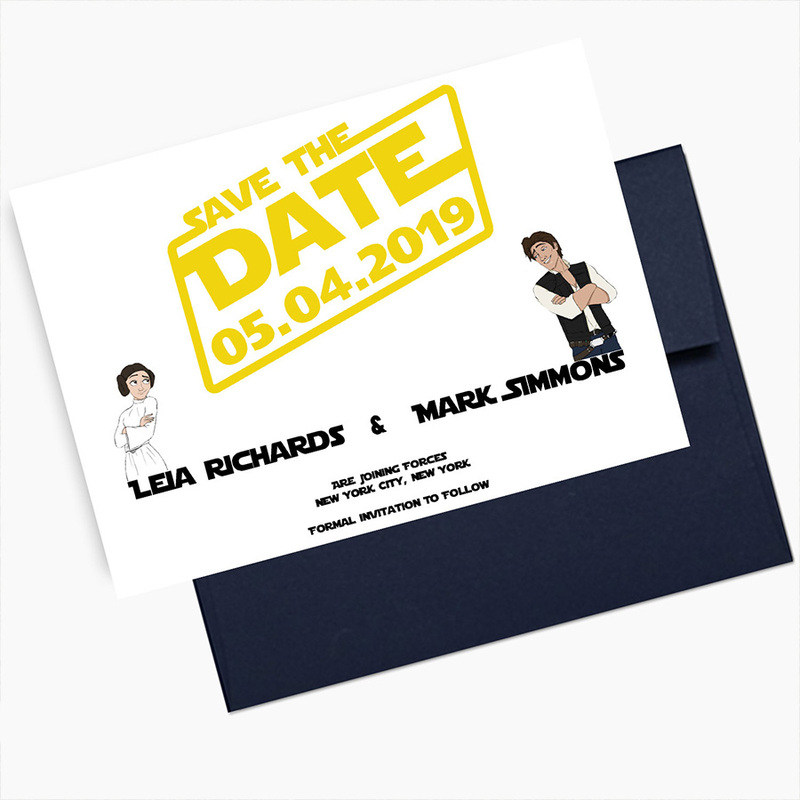 I love wax seals (I follow soooo many wax seal accounts on Instagram), so I couldn’t resist the temptation to buy a Star Wars wax seal for closing our invitation suites. It wasn’t a terribly expensive detail. 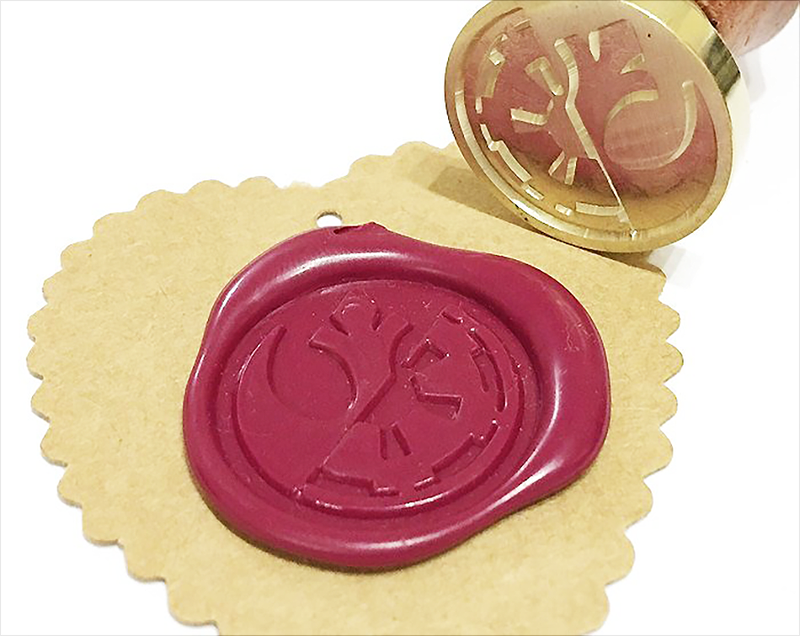 You can get the stamper and a stick of sealing wax for less than $20. I purchased some pink sealing wax sticks separately to match our wedding colors that fit in a glue gun! It was easy (and a lot of fun). 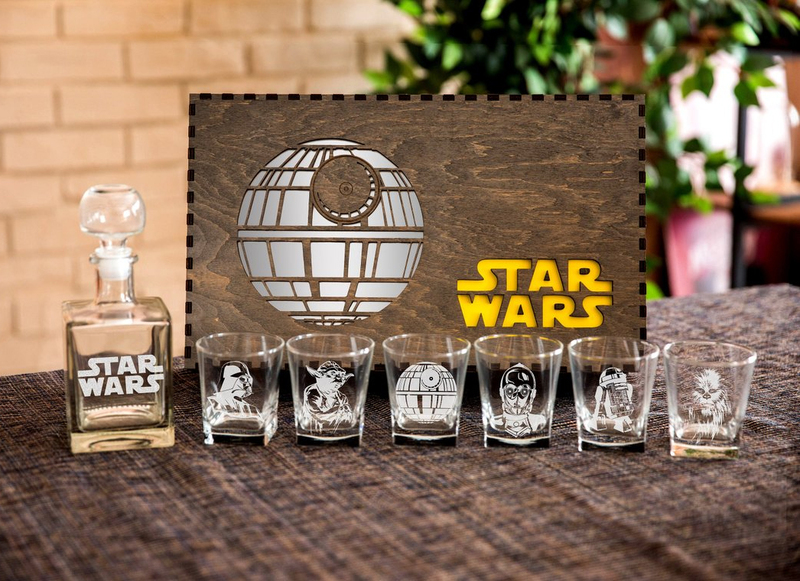 If we were going to spend money, I wanted it to be on things that were worth keeping. 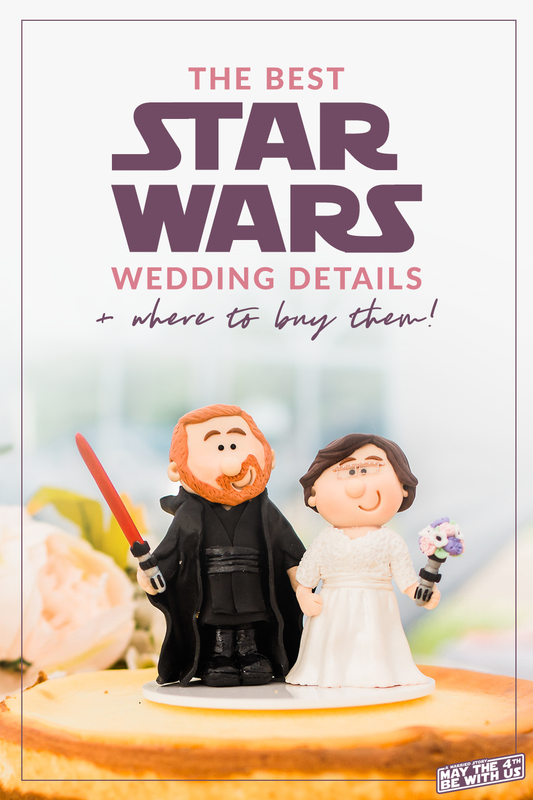 I remember asking myself “What the heck am I going to do with a Star Wars cake topper?” – because it seemed kind of unlikely that I’d be able to sell it easily after the wedding. 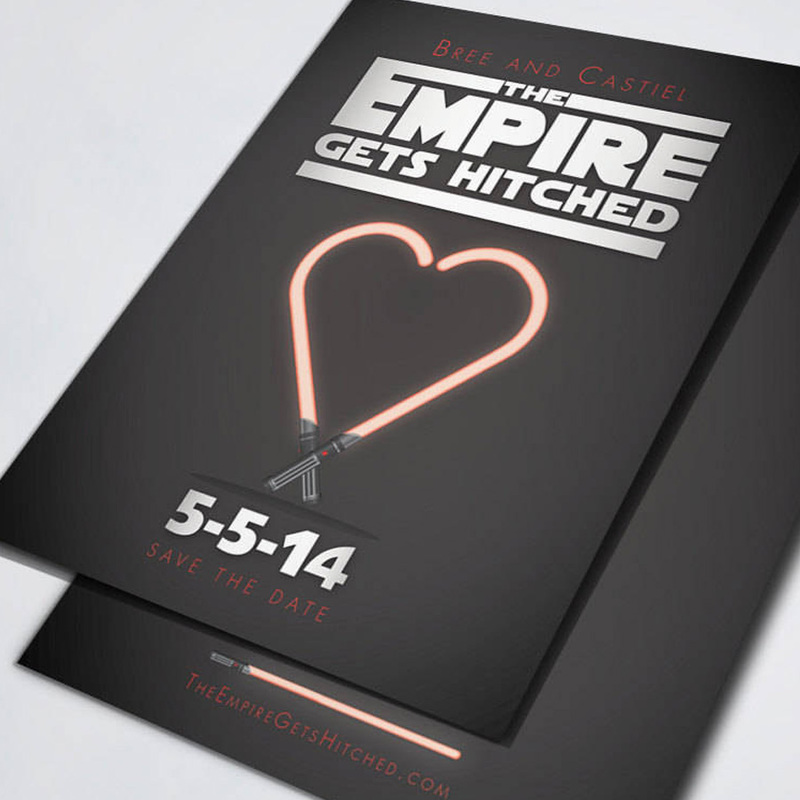 It’s not every day that couples decide to have a Star Wars wedding. So if I was spending the money, it was going to have to be worth it. 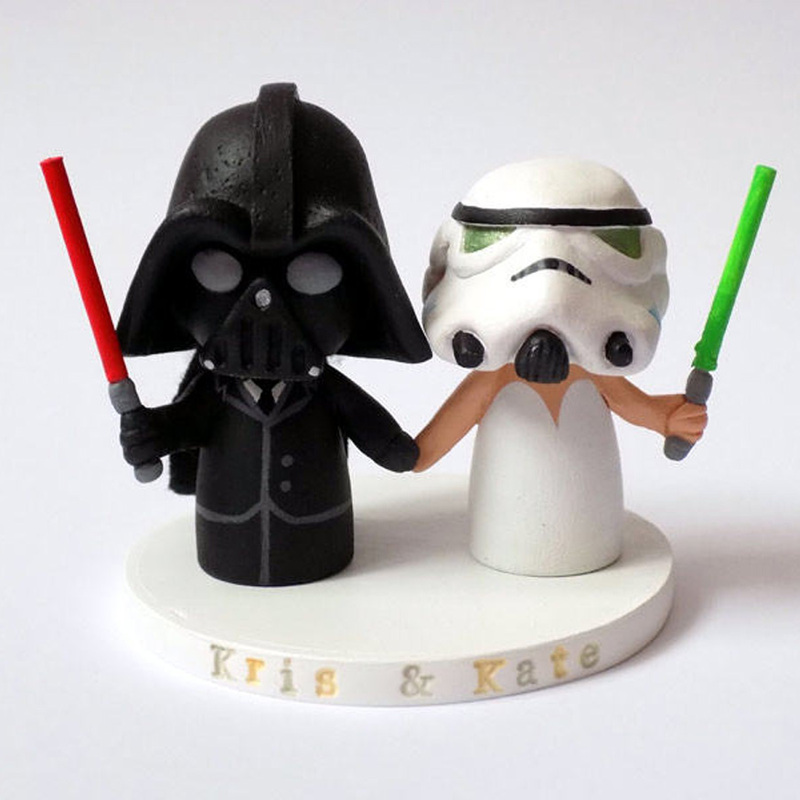 When I saw these personalized bride and groom cake toppers, I lit up brighter than a lightsaber. I love them even long after our wedding, and they’ve made for such a wonderful keepsake and reminder of our special day. 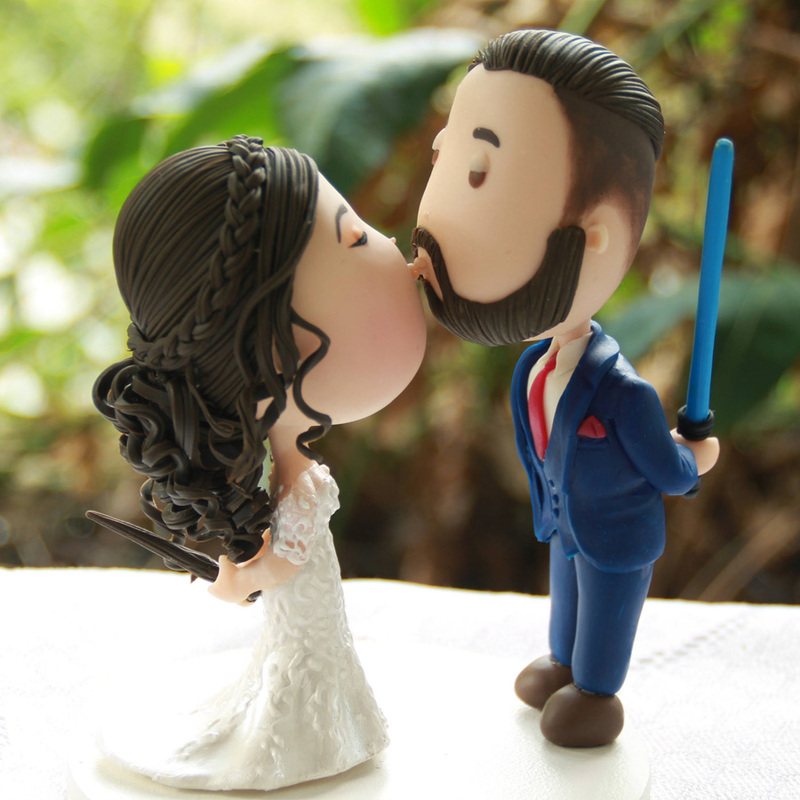 And if you’re wondering… YES they were totally custom made to look like us, down to the creator using pictures of us and our attire – including my lightsaber bouquet! 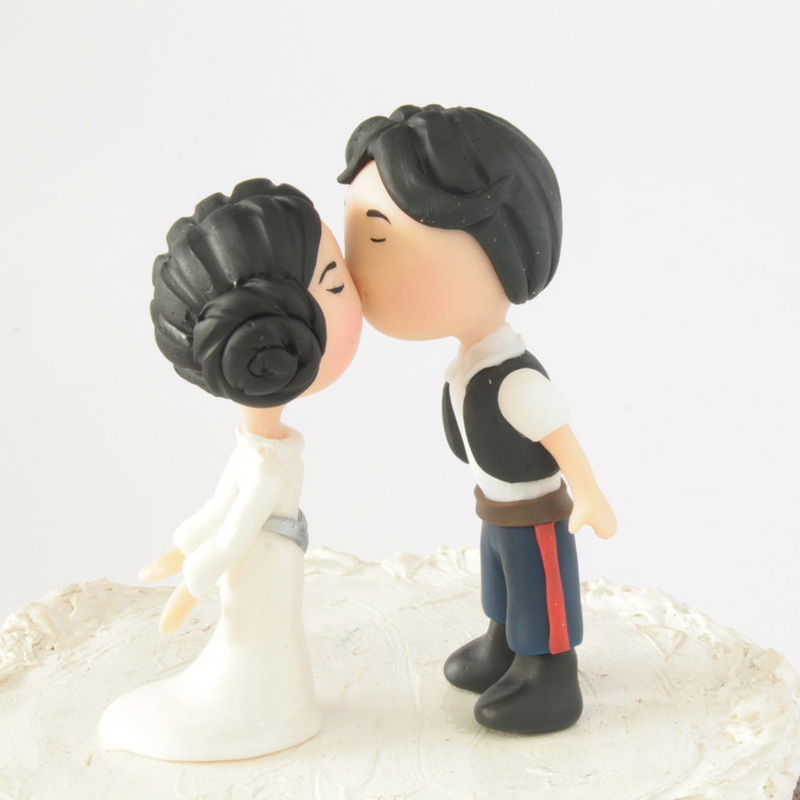 There’s several shops on Etsy that create super cute, personalized Star Wars wedding cake toppers. I chose ours because I liked the cutesy style, but maybe you’d prefer something different, like these that I also considered. This is one of those purchases that I didn’t seek out. 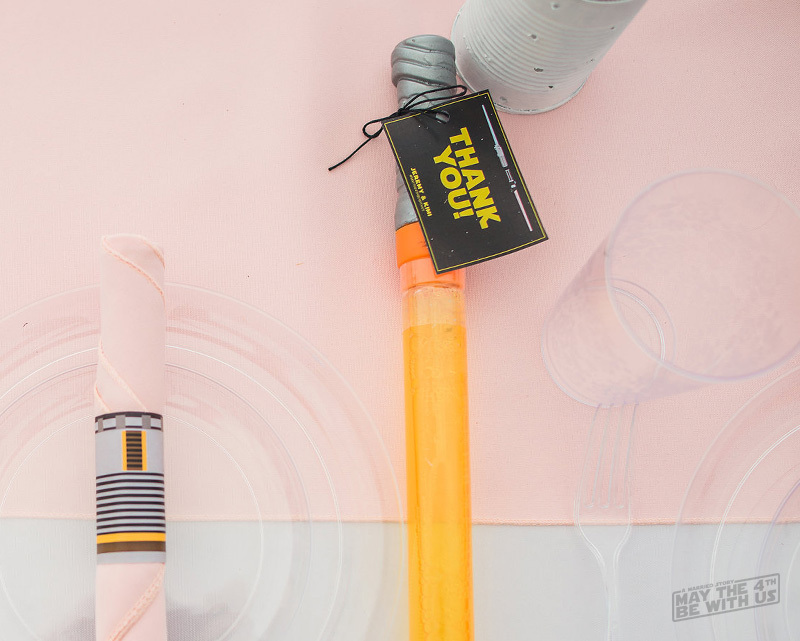 I hadn’t even considered a detail like napkin rings and the thought wouldn’t have even crossed my mind if not for spending time on Etsy searching for Star Wars inspired wedding stuff. 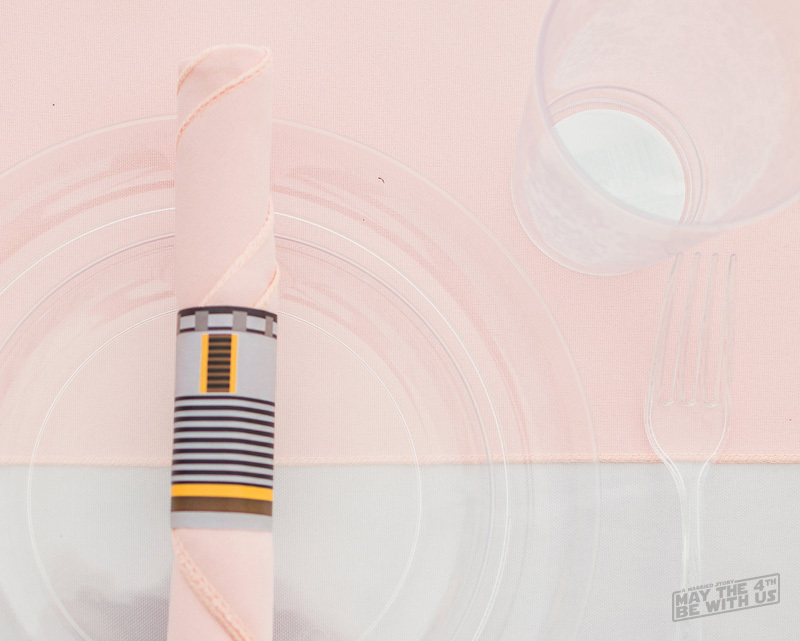 But then I came across these Star Wars Lightsaber printable napkin rings, I knew I needed them. I admit that this is one detail that drove my husband-to-be insane. The closer we got to our wedding date, the more little “easy” projects I seemed to tack on. This was one of those things. Another trip to Staples, and we had these printed on some sturdy paper. I cut them out, and individually glued them into “rings” for holding the napkins securely. In retrospect, it’s sort of a silly detail. But truth is, it’s one of many silly details that I think made our wedding day really fun. I want to preface this with… These were a huge flop at our wedding. I purchased a big set of large bubble wands from Oriental Trading with the idea in mind that I would spray paint the ends to make them look like lightsabers. 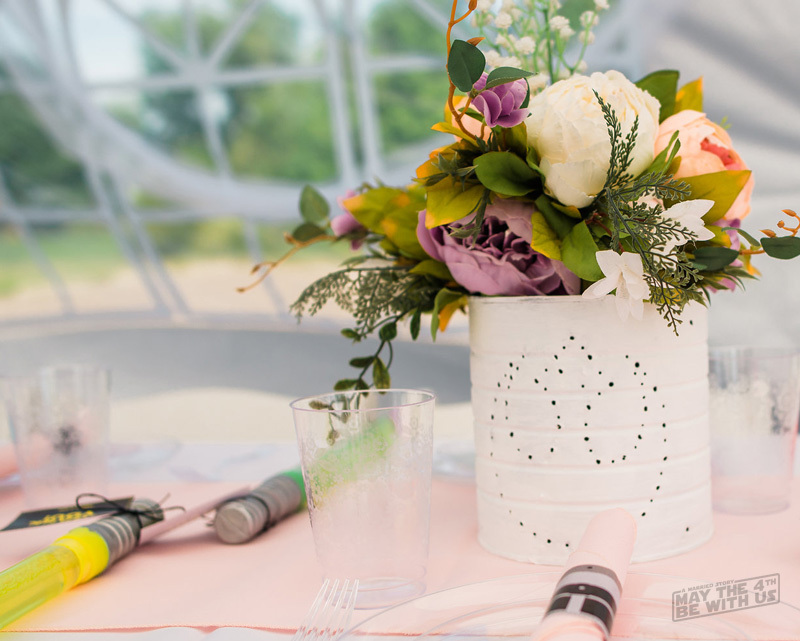 That idea worked out well, and they looked super cute – and they added such a bright touch to our wedding pictures. The flop is… I wanted to add glow in the dark solution to the bubbles to make them glow in the dark. Unfortunately, I tried this a couple of different ways and found that the solution was causing the bubbles not to work. Huge bummer there. I also spent a ridiculous amount of time trying to tie on little Thank You notes I designed for them. I waited until the day of the wedding because I didn’t want the paper to get folded or banged up. My acrylic nails got in the way and I wasted a ton of time on them. At least they look cute? I had these grand aspirations of an end of the night send off. I envisioned super cute pictures of people with glowing mini lightsabers blowing bubbles at us as we left. Unfortunately, given the schematics of our wedding day and needing to be present for returning rentables, we never got a send off and the bubbles never got used. This little hack turned out to be a huge money-saver for us. 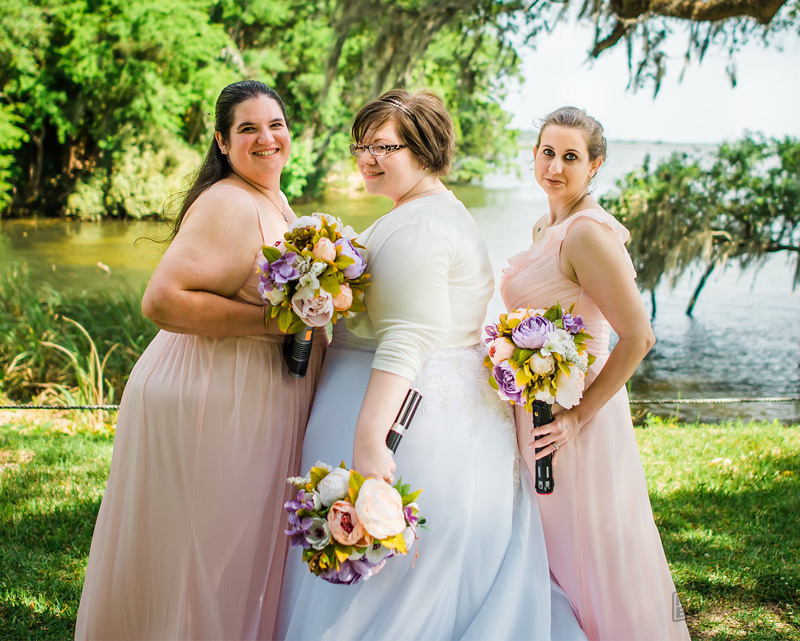 Yes, that’s right… my bridesmaids and I made our own bouquets! Look, I’m not trashing anyone out there who makes a business out of arranging bouquets. I’m sure a professional could have done a better job than we did. But I wasn’t about to spend $100 just on my bouquet, plus have to provide my own flowers. We were trying hard to stick to our budget, and spending over $300 just on the cost of labor for 3 bouquets wasn’t going to fit. To be fair, we got really lucky. One of my friends had some otherwise broken lightsabers that their kids weren’t playing with anymore, and she offered them up to me when I started talking about my lightsaber bouquet idea. I purchased my lightsaber hilt new, and Jeremy helped me remove all of the inside bits to make room for the flowers. 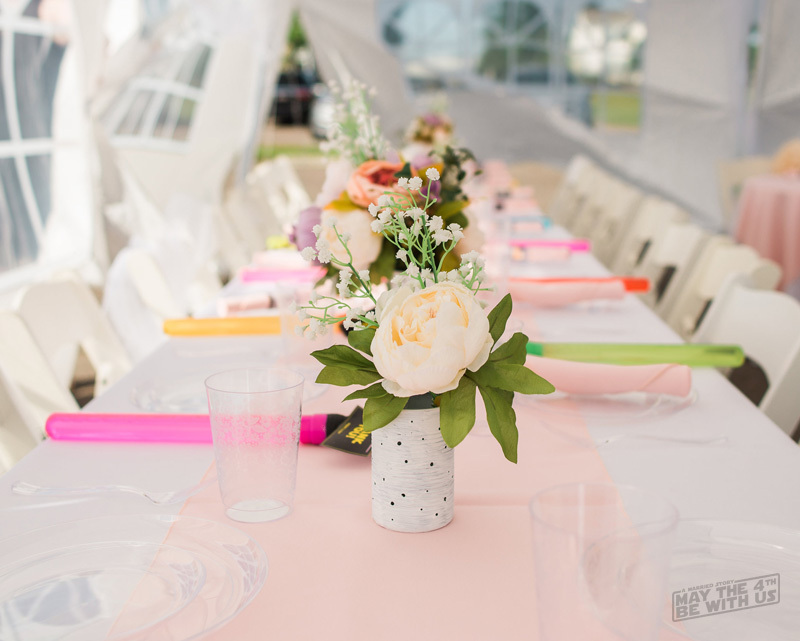 Speaking of flowers… I found those gorgeous faux peonies on Amazon and they are every bit as beautiful in person as they are in pictures. No really… I was totally shocked when they arrived, because they were great quality for the price. They came in already pre-made, single color bundles (that would have been just as gorgeous as they were). We separated them, and created a mixed arrangement for the bouquets as well as our centerpieces. I won’t sugar coat it. Making these centerpieces was the biggest pain ever. Out of everything we DIY’d for our wedding, this particular task was frustrating and I really didn’t enjoy it. I had lots of little cuts on my hands the day of our wedding because of the little bits of sharp edges on the inside of the cans from the little holes. Ouchies. In retrospect, it may have been easier to just use a hammer and nail. Lessons learned. At least they turned out nice – and they looked really pretty towards the end of the evening with the flameless tea light candles we put into them. Oh my dear husband… This is exactly why I love him. He spent much of the wedding planning not really feeling excited about planning. It was a lot of stress putting it together on our own and he didn’t really have opinions on most of what we did. He just wanted to marry me – the logistics weren’t as important. And then one day, he excitedly came to me with a little DIY project of his own. Seriously ladies… get yourself a man that looks at you the way my husband looked at this Star Wars ring box he wanted to make. Good grief. 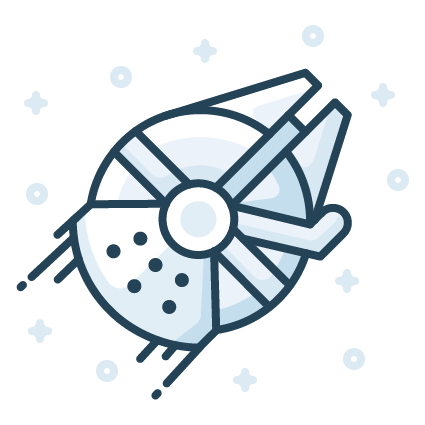 This is a Holocron – a sort of information storage device used by both Sith and Jedi. They are made in different shapes, but Jeremy wanted to make this triangular shape specifically. He told me a story about a Sith who spent months and months making one and how many times he failed in doing so. The amount of effort that went into this thing is unreal. It included using a 3D printer to make the triangular shapes, having the inner design printed on transparency film (thanks again, Staples! ), and some strange electrical rigging that I won’t even bother attempting to explain because that’s all on Jeremy. Our Holocron ring box isn’t perfect, but it’s much loved and sitting on a dresser in our bedroom. It’s a great keepsake and made a real impression on our guests. Not crafty? 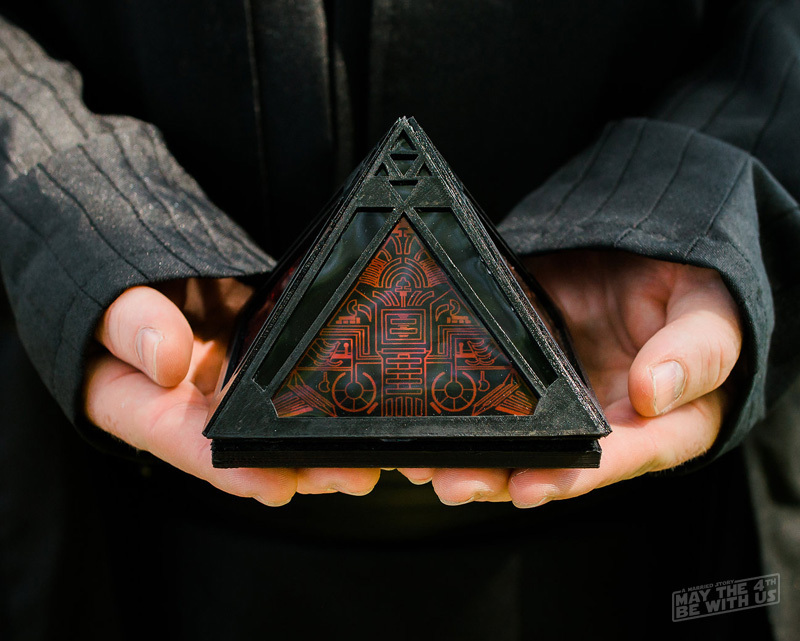 Buy a Holocron Star Wars Ring Box already made for you! Which detail is your favorite? 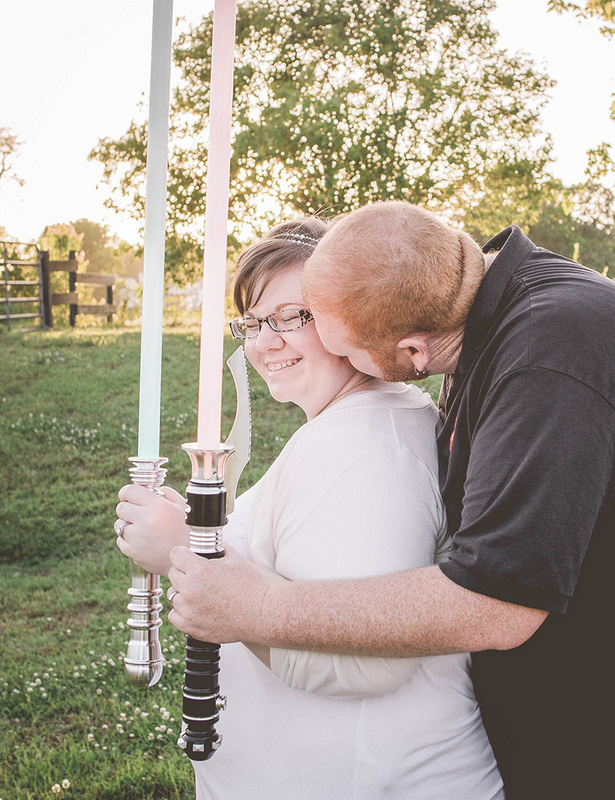 So much love went into planning our perfect Star Wars wedding. It really was all in the details – even the smallest ones. 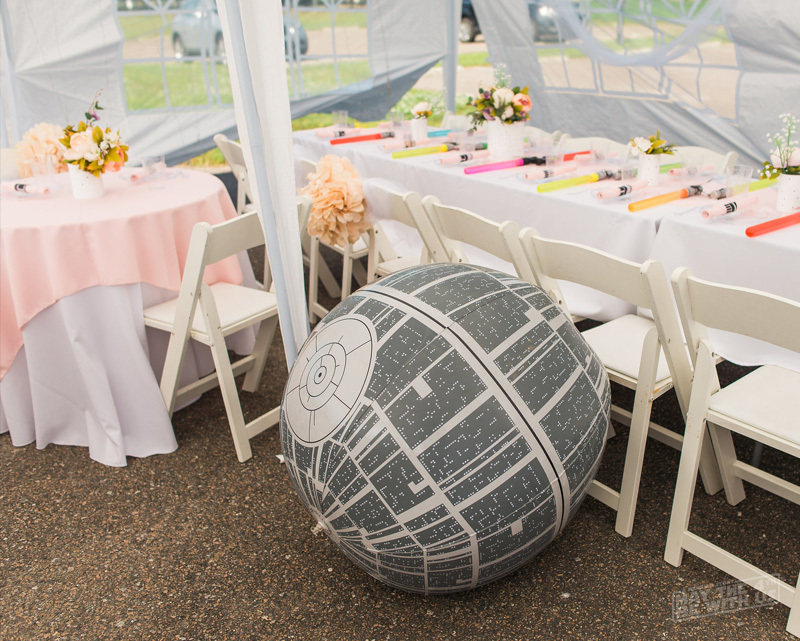 Which detail would you love to incorporate into your own Star Wars inspired wedding?